This week’s edition of WWE’s Monday Night Raw was a nice reboot for Raw thanks to the rise of Finn Balor, a major title change, and the debut of the women’s Tag Team Titles. The show was focused on the in-ring matches, with two matches getting over 15 minutes in the last hour. Everything felt like it mattered more, and there were less of the cheesy comedy bits we tend to see on Raw. Normally I don’t write columns breaking down Raw, but this week’s show was an exception with some newsworthy items, so I figured it needed a breakdown takeaway style. Last month on WWE Monday Night Raw, the McMahon family foursome of Vince McMahon, Stephanie McMahon, Shane McMahon, and Triple H (Stephanie’s husband) stood in the ring talking about a “new” WWE. That was December 17, which was the last live Raw of 2018 because the Christmas Eve and New Year’s Eve shows were taped. Last week’s show went up against the NCAA College Football Championship. This week, there wasn’t any major sports competition, so WWE seemed to load up on big matches, plus unadvertised appearances from big names, like John Cena CEO & Chairman Vince McMahon. Here are 5 Takeaways from this week’s Raw. The Universal Championship match between Brock Lesnar and Braun Strowman has been advertised since last month’s TLC pay-per-view, when Strowman “beat” Baron Corbin in a TLC match thanks to some help from other wrestlers. A few weeks before that, Strowman had surgery on his right elbow to remove bone chips. In WWE storylines, they called it a “shattered elbow” because they like to lie about injuries for storyline purposes. The expectation was that Strowman would be fine for the Rumble match. Last night on Raw, Strowman cut a promo about how he’s going to beat Lesnar. Corbin showed up, talked trash, and Strowman chased Corbin out to the parking lot where Corbin hid in the limo. Strowman broke the window of the limo with a steel pipe, then ripped off the door handle before Corbin ran away. It was the limo used by Vince McMahon, who showed up and was mad about what Strowman did. Vince told Strowman he would be fined $100,000 for that, so Strowman responded by saying that this limo isn’t even worth that, which led to Vince telling Strowman he was out of the Universal Title match. Strowman was pissed off, so he shoved the limo over, which is similar to stunts Strowman has done in the past. The assumption that most of us had when we watched Raw last night was that Strowman isn’t cleared to wrestle and that’s why he was pulled. There might be some truth to that, but according to Dave Meltzer of the Wrestling Observer (available via subscription), Vince McMahon soured on the Lesnar vs. Strowman and made the decision to change the match weeks ago. The story is that Vince felt like Strowman has lost to Lesnar a few times in the past already, and doing it again would hurt Strowman. The plan is for Lesnar to face Seth Rollins at WrestleMania, which meant that Strowman would have had to put over Lesnar in this match just like he did at Crown Jewel last year, Royal Rumble last year (in a triple threat with Kane), and No Mercy in 2017. Apparently, the reason Vince continued to advertise Lesnar vs. Strowman was to sell tickets for the Rumble, which is a tactic Vince has used in the past for matches like Alexa Bliss vs. Trish Stratus at Evolution last year. I wrote more about the situation on my website as well. I feel bad for Strowman because he should have won the Universal Title last year at some point, yet WWE failed to pull the trigger on him. The fans still respond to him and he’s one of the most popular guys on Raw, but he has definitely lost a lot of momentum to his inability to win the Universal Title. Strowman was not replaced in the Royal Rumble match due to injury. The plan was changed because Vince McMahon didn’t want Strowman to lose to Lesnar again, so that’s why we have a new match. As they say in the NFL, “next man up” and that man is an opponent that Lesnar has never faced before. 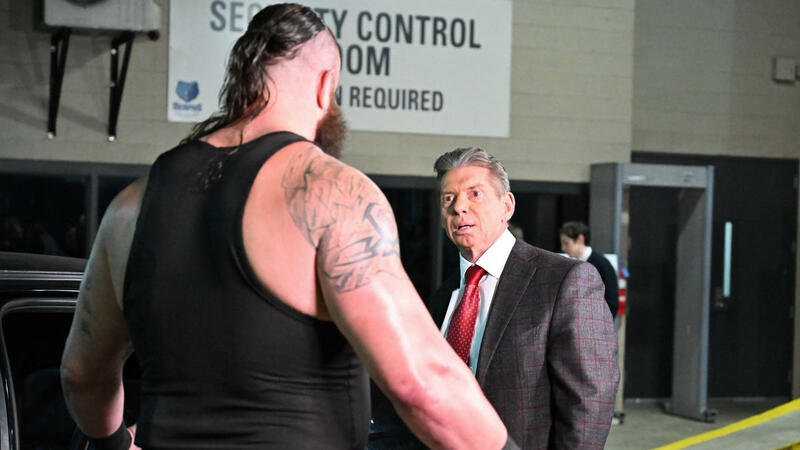 After Strowman was taken out of the Rumble match, Vince McMahon cut a promo in the ring at the top of the second hour. He was interrupted by John Cena, Drew McIntyre, Baron Corbin, and Finn Balor, with all four men making the case that they should be the guy to face Lesnar at the Rumble. During that promo, Balor said that he knew Vince McMahon didn’t believe in him, but Balor knew the fans believed in him, so he would prove it. Vince, in that promo, questioned if Balor could beat the other three guys since they were all bigger than him, putting Balor in the familiar underdog role. After a physical altercation that was won by McIntyre, Vince put them in a Fatal 4-Way match for later in the show. Since Raw is a very long show at three hours, there was time for Balor to have another match against Jinder Mahal, who wanted a chance to prove himself. Mahal beat up Balor for about eight minutes of their ten-minute match, then Balor made the big comeback and got the win. The idea that WWE wanted to plant in our heads was that Balor may be too tired to win the main event, even though most of us assumed he would win. The main event was an exciting match between Balor, Cena, McIntyre, and Corbin. There were several finishing moves done in the match, there were moments where it looked like any of the four guys could win, and the crowd was also really into the match. In the end, Balor took out McIntyre with a leaping DDT and then he hit John Cena (who was knocked down by a Claymore Kick from McIntyre) with his top rope Coup de Grace (double foot stomp to the chest) for the pinfall win after 20 minutes of action. Balor pinning Cena was meaningful because of Cena’s time as WWE’s top guy for the last 14 years. But losing clean to Balor wasn’t the only thing that Cena did for Balor on this show. It’s a common thing in wrestling where you use the legendary veteran wrestler to elevate the current star and make the fans believe in the current star more. A famous example of this was when Hulk Hogan lost to Ultimate Warrior at WrestleMania 6 and then raised his hand after giving him the WWE (WWF in those days) Title. 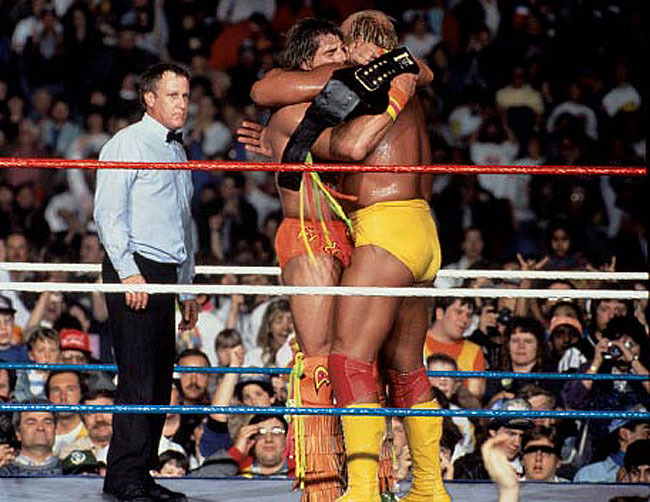 A year later, Hogan was back in the main event, winning the WWE Title again because Warrior failed as a top guy, but it’s the thought that counts. At WrestleMania 29 in 2013, The Rock put over John Cena for the WWE Title and raised his hand after the match. We have seen it happen many times in wrestling history and that’s the role that Cena, at 41 years of age, now has as a part-timer. Balor is not a “new” star in WWE, considering he was the first Universal Champion on Raw three years ago, but he is a popular wrestler that has been booked poorly for most of the last two years. Balor is popular with the fans, he’s very good in the ring, and he works hard, so seeing him main event is something WWE fans should be happy about. Do I expect Balor to beat Lesnar at the Royal Rumble? Absolutely not. I think Lesnar will win a competitive match, similar to his matches with AJ Styles at Survivor Series 2017 and Daniel Bryan at Survivor Series 2018. The story will be that Balor came close to winning, but he will come up short in a competitive battle. I think WWE will stick with the Lesnar vs. Rollins plan at WrestleMania and if they don’t, I would be very surprised by that. When WWE announced Dean Ambrose would defend the Intercontinental Championship against Bobby Lashley and Seth Rollins on Raw, I thought that Ambrose would retain the title. The reason for that is because Ambrose just won the title last month at TLC, so why take it away from him? With that said, I don’t think it’s a bad decision by any means because it could be argued that Lashley needs the title more than Ambrose and it will give Lashley more credibility moving forward. The match was great with Seth Rollins getting double teamed by the heel duo of Ambrose and Lashley throughout the match. Lio Rush, who is Lashley’s hype man (aka manager), also played a big part in the match because it seemed like any time Rollins got some momentum going, Rush was there to slow him down by doing something cheap. Since there are no disqualifications or countouts in WWE triple threat matches, it meant that Rush could interfere without the risk of costing Lashley the match. The finish of the match was creative with Rollins hitting a superkick on Lashley and he going for The Stomp on Ambrose, but Rush pulled down the top rope to prevent Rollins from hitting the move. Lashley capitalized on that with a Spear on Ambrose for the pinfall win. It was the first time Lashley has won the Intercontinental Title in his WWE career. I think Lashley had some trouble adjusting to WWE when he came back to the company after WrestleMania last year, but he’s doing well in his heel role with Rush as his manager. Giving him the IC Title will make Lashley feel like a bigger star in the eyes of the fans. Even though he lost the match, Rollins was the star of the match. The crowd is behind him as much as they have ever been. I don’t think Rollins is hurt by not winning back the IC Title because he’s the favorite to win the Royal Rumble match. As for Ambrose, I’m not sure what’s next for him. I thought he would hold the IC TItle until WrestleMania and drop it to a face wrestler, but now it is probably up to Bobby Lashley to do that. If Lashley holds the Intercontinental Title all the way to WrestleMania, it could lead to him dropping it to a popular face like Finn Balor (who has never won the IC Title), or perhaps Elias. Another option could be Kevin Owens if he comes back in time, since Lashley was the one that injured him. It would put Owens in the face role, which would be a first for his WWE career. It’s not known if he’ll be ready for sure by WrestleMania, but I think he should be. The new WWE Women’s Tag Team Titles were officially introduced on Raw during the “A Moment of Bliss” talk show hosted by Alexa Bliss. That’s the same Alexa Bliss who was shown moments earlier in her dressing room covering up her breasts when a random dude entered her room with a coffee. Yes, that really happened. Bliss announced, on behalf of the company, that the Women’s Tag Team Champions will be crowned at the Elimination Chamber pay-per-view in Houston on Sunday, February 17. The match will see three Raw tag teams face off with three Smackdown tag teams in an Elimination Chamber match. The winners of that match, which could theoretically see twelve women in the Chamber at the same time, will become the Tag Team Champions. I like the look of the titles. They are better than the old Divas Title with the stupid butterfly design on them. The white background design is like the Raw Women’s Title and Smackdown Women’s Title with the white background. 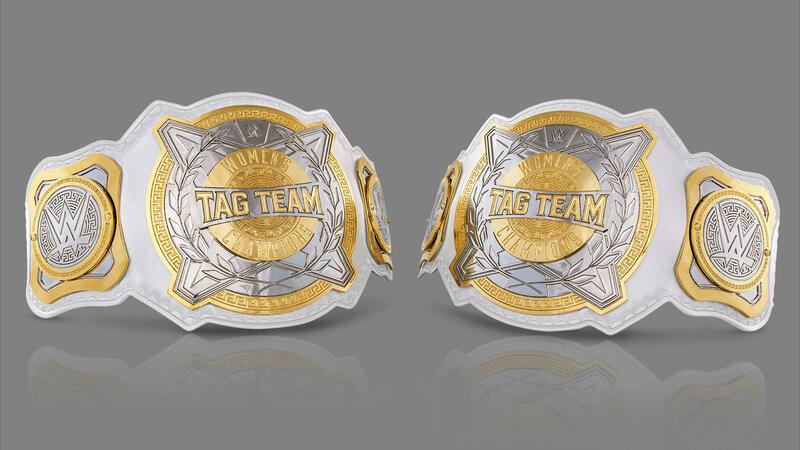 What we don’t know is if the Women’s Tag Team Titles will be exclusive to Raw or Smackdown. They might be titles where the champions can appear on Raw or Smackdown on any given week, which is what WWE sometimes did during the previous brand split last decade. My guess is that if the first champions are on Raw, then it’s likely that WWE will introduce Smackdown Women’s Tag Team Champions later as well. It wouldn’t make sense to allow these champions to be on both shows while the other champions are brand exclusive. As I have written previously here on The Comeback, I think Sasha Banks and Bayley would be the perfect team to be the Women’s Tag Team Champions since they are a popular duo that the fans would get excited about as champions. If you put it on a heel team it won’t have the same effect. Put it on faces, let the fans cheer the new champions and it will make the titles feel prestigious right away. This week’s Raw was a step in the right direction, which is why I wanted to write this column focusing on that. It’s easy to complain about a bad show or to write about why WWE should have done something different to make things better. We should be happy when a show is great and praise WWE for making good decisions. Pushing Finn Balor is a great decision, using John Cena to put over Balor was smart, introducing Women’s Tag Team Titles is exciting, and I’m happy that Bobby Lashley is doing well as a heel. I feel bad for Braun Strowman getting booked inconsistently though, so hopefully he can get some of that momentum back in the near future. The next major WWE pay-per-view is the Royal Rumble on January 27. Let me know if you have any ideas for me to write a history piece about the Rumble. I’m always interested in seeing your feedback. My contact info is below. Thanks for reading.